Daniel Radcliffe (right) plays Billy, in a scene with Pat Shortt as Johnnypateenmike, in the Broadway production of Martin McDonagh's The Cripple of Inishmaan. Daniel Radcliffe's character Billy is a crippled 17-year-old boy whose parents drowned in a mysterious boating accident. Even before he finished his eight-film run as Harry Potter, actor Daniel Radcliffe spent a considerable time devoted to the stage, both in London and New York. He appeared on Broadway in Equus and spent a year playing J. Pierrepont Finch, the lead role in the musical How to Succeed in Business Without Really Trying. On Sunday night, the 24-year-old actor opens at Broadway's Cort Theatre in a production of Martin McDonagh's dark Irish comedy, The Cripple of Inishmaan. When Daniel Radcliffe makes his first appearance, it's something of a shock; his left arm is lifeless, his left leg is locked straight, his body twists as he shuffles uncomfortably across the stage. Radcliffe is the title character in The Cripple of Inishmaan: Billy Claven, an orphaned 17-year-old boy whose parents drowned in a mysterious boating accident and who dreams both of love and of a better life. "I responded to the character of Billy," Radcliffe says, "just because he is such a beaten, battered-down, abused character, who retains such a sense of dignity and integrity and strength and actually still retains his compassion for other people, which is pretty remarkable, given the way he's treated." The play takes place on a tiny island off the west coast of Ireland in 1934, where the villagers live a harsh, impoverished existence. Several of the characters decide to leave, in hopes of appearing in a movie that's being filmed nearby. Playwright McDonagh has created a world that is both cruel and sympathetic, according to director Michael Grandage. "What's lovely about the play is that it offers an insight into a very small community," Grandage says. "We, the audience, sit and observe something from outside; watching a past life, a past world, this little remote island off Ireland from the early 1930s and the people that inhabit it and their need, in some cases, to get away from it." The characters in McDonagh's comedy can almost seem like they come from a parody of classic Irish theater, but actress Sarah Greene, who hails from Cork and plays Billy's love interest, Helen, says these are not caricatures. "The mad thing is that there are still characters like this, living on the Aran Islands, so these are real people," she says. "And what's funny watching it is they don't seem like real people, because they're so bizarre! They are very, very strange human beings." McDonagh uses a clever device to get their dialect across to audiences: line repetition. "He's got a very particularly poetic voice, actually, and he's got a musical voice, I think," Grandage says. "What's fascinating about that is he knows that the play's going to open with an accent that is probably, for most people watching it, different to the way that they speak," he says. "He gives us, therefore, the first line in duplicate, so just in case we miss it in the very first voice that gets heard, as our ear starts to adjust, the second voice gives it to us again, in a different form. "So by the time we've heard two voices say it, while the voice might need an adjustment to our ear, we at least are following it," Grandage says. "It's a rather brilliant device that he does quite a lot and consistently, right the way through the play." Accessibility is important for Grandage. When he founded his company last year, he asked name actors, like Radcliffe, if they'd be interested in not just acting, but training young directors and designers, and performing free for schools from disadvantaged areas in and around London. Throughout their five-play season, the company made 100,000 tickets available at a lower cost to help young people see the work. On Broadway, The Cripple of Inishmaan is making a block of 10,000 tickets available at $27 for the length of the four-month run, in the same spirit. For the actors in the company, "it makes a difference to the way they approach the work," Grandage says. "It's not just about playing a role." 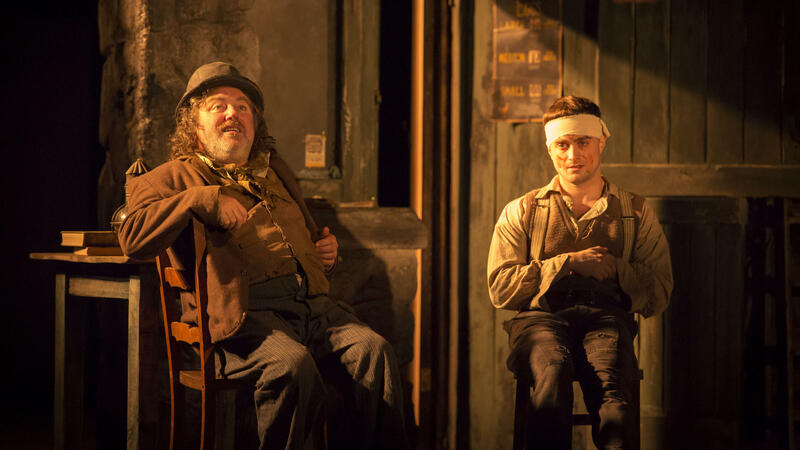 Grandage sent Radcliffe five plays, and the actor says the role of Billy Claven in The Cripple of Inishmaan was the obvious choice. While Radcliffe continues to have an active film career, he's also committed to the stage. "I'd definitely like to come back and keep doing theater for hopefully the rest of my career," he says. "It's something that I feel like every time I come away from it, I come away from it a better actor." Even before Daniel Radcliffe finished his eight-film run as Harry Potter, he spent a considerable amount of time devoted to the stage both in London and New York. He appeared on Broadway in "Equus" and spent a year playing the lead role in the musical "How to Succeed in Business Without Really Trying." Tonight, the 24-year-old actor opens in a production of Martin McDonagh's dark Irish comedy "The Cripple of Inishmaan." Jeff Lunden talked to Daniel Radcliffe along with some of the cast and crew and has this story. JEFF LUNDEN, BYLINE: When Daniel Radcliffe first walks out, it's something of a shock. His left arm is lifeless. His left leg locked straight. His body twists as he shuffles uncomfortably across the stage. 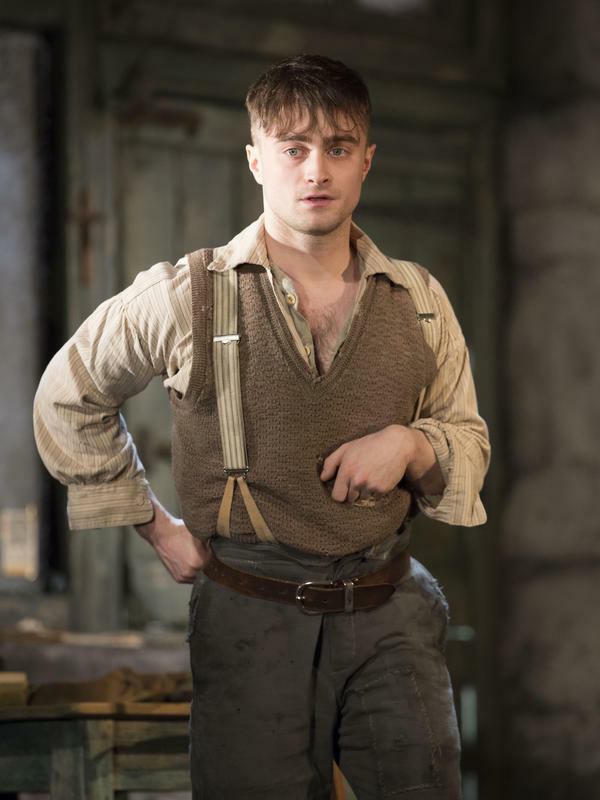 Radcliffe is the title character in "The Cripple of Inishmaan," Billy Claven, an orphan 17-year-old boy, whose parents drowned in a mysterious boating accident and who dreams both of love and of a better life. DANIEL RADCLIFFE: I responded to the character of Billy just because he is such a beaten, battered-down, abused character who retains such a sense of dignity and integrity and strength and actually still retains his compassion for other people, which is pretty remarkable given the way he's treated. SARAH GREENE: (As Helen McCormick) Mrs. Osbourne isn't cripple Billy's aunty at all anyways. She's only his pretend aunty, same as the other one. Isn't that right, Billy? RADCLIFFE: (As Cripple Billy) It is. GREENE: (As Helen McCormick) They only took him in when Billy's mom and dad went and drowned themselves when they found out Billy was born a cripple-boy. RADCLIFFE: (As Cripple Billy) They didn't go and drown themselves. GREENE: (As Helen McCormick) All right. RADCLIFFE: (As Cripple Billy) They only fell overboard in rough seas. GREENE: (As Helen McCormick) Uh-huh. What were they doing sailing in rough seas so. And wasn't it at night-time, too? RADCLIFFE: (As Cripple Billy) Trying to get to American by the mainland they were. GREENE: (As Helen McCormick) No, trying to get away from you they were. LUNDEN: The play takes place on a tiny island off the west coast of Ireland in 1934, where the villagers live a harsh, impoverished existence. Several of the characters decide to leave in hopes of appearing in a movie that's being filmed nearby. Playwright Martin McDonagh has created a world that is both cruel and sympathetic, says director Michael Grandage. MICHAEL GRANDAGE: What's lovely about the play is that it offers an insight into a very small community. We, the audience, sit and observe something from outside, watching a past life, a past world - this little remote island of Ireland from the early 1930s and the people that inhabit it and their need in some cases to get away from it. LUNDEN: The characters in McDonagh's comedy can almost seem like they come from a parody of classic Irish theater. GARY LILBURN: (As the doctor) Have you been laying off the drink, Mrs. O'Dougal, I said. JUNE WATSON: (As Mammy) I have been laying off the drink or I've sort of been laying off the drink. PAT SHORTT: (As Johnnypateenmike) She's a pint of porter now and then is no harm at all. WATSON: (As Mammy)Is no harm at all. SHORTT: (As Johnnypateenmike) Is good for you. LILBURN: (As the doctor) Well, so long as you keep it at a pint of porter is the main thing so. WATSON: (As Mammy) It is the main thing, and a couple of whiskeys now and then. LUNDEN: Actress Sarah Greene, who hails from Cork in the south of Ireland, says these are not caricatures. GREENE: The mad thing is that there are still characters like this living on the Aran Islands. So these are real people. And what's funny watching it is - they don't seem like real people because they're so bizarre. They are very, very strange human beings. LUNDEN: And playwright Martin McDonagh uses a clever device to get their dialect across to audiences, says director Michael Grandage. GRANDAGE: Well, he's got a very particularly poetic voice, actually. And something - he's got a musical voice, I think. And what's fascinating about that is he knows that the play is going to open with an accent that is probably for most people watching it different than the way they speak. And he gives us therefore the first line in duplicates. So just in case we miss it in the very first voice that gets heard as our ear starts to adjust, the second voice gives it to us again in a different form. So by the time we've heard two voices say it, while the voice might need an adjustment to our ear, we at least are following it. It's a rather brilliant device that he does quite a lot and consistently right away through the play. GREENE: (As Helen McCormick) What would I want to go out walking with the cripple-boy for? It isn't out walking you'd be anyways. It would be out shuffling because you can't walk. I'd have to be waiting for you every five yards. What would you and me want to be out shuffling for? RADCLIFFE: (As Cripple Billy) Well, for the company. GREENE: (As Helen McCormick) For the company? RADCLIFFE: (As Cripple Billy) And. GREENE: (As Helen McCormick)And what? RADCLIFFE: (As Cripple Billy) And for the way sweethearts be. GRANDAGE: ...But training young directors, training young designer, performing free for schools from disadvantaged areas in and around London -100,000 tickets at 10 pounds. You know, it makes a difference to the way they approach the work as well. It's not just about playing a role. LUNDEN: Grandage sent Radcliffe five plays and the actor says the role of Billy Claven in "The Cripple of Inishmaan" was the obvious choice. While Radcliffe continues to have an active film career, he's committed to the stage. RADCLIFFE: I definitely like to come back and keep doing theater for hopefully the rest of my career. It's something that I feel like every time I come away from it, I come away from it a better actor. LUNDEN: Radcliffe and the rest of the cast will be on Broadway through July 20. And true to the Grandage company's mission, 10,000 seats will be available at reduced prices. For NPR News, I'm Jeff Lunden in New York. MARTIN: You're listening to WEEKEND EDITION from NPR News. Transcript provided by NPR, Copyright NPR.